Migrate from 8.1.0-3.5.2 to 8.2-?.?.? Displaying numerous POIs in the camera is a challenge. How many POIs should be offered? How to deal with POIs in same direction? What is the maximum range to show POIs and how to display a long description? The following example cover frequently asked questions related to the POI browser use case and consists of five parts plus a bonus section. POIs usually have a name and sometimes a quite long description. Depending on your content type you may e.g. 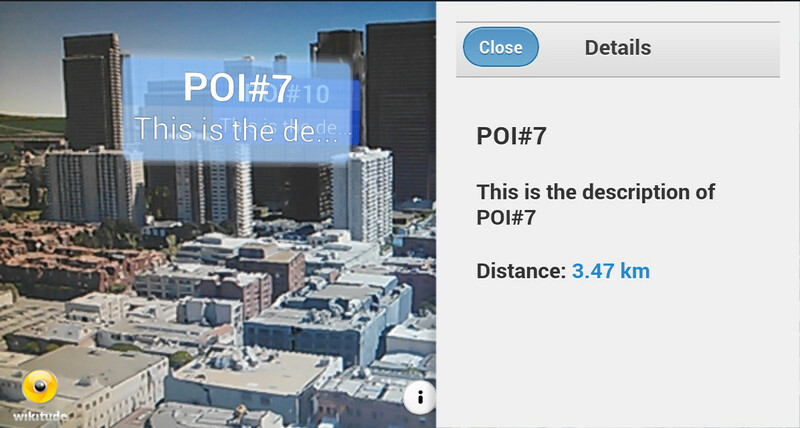 display a marker with its name and cropped description but allow the user to get more information after selecting it. jQuery Mobile is an easy way to create appealing user interfaces for mobile devices. It takes the "write less, do more" mantra to the next level: Instead of writing unique apps for each mobile device or OS, the jQuery mobile framework allows you to design a single highly-branded web site or application that will work on all popular smartphones, tablets, and desktop platforms (quote from their website). 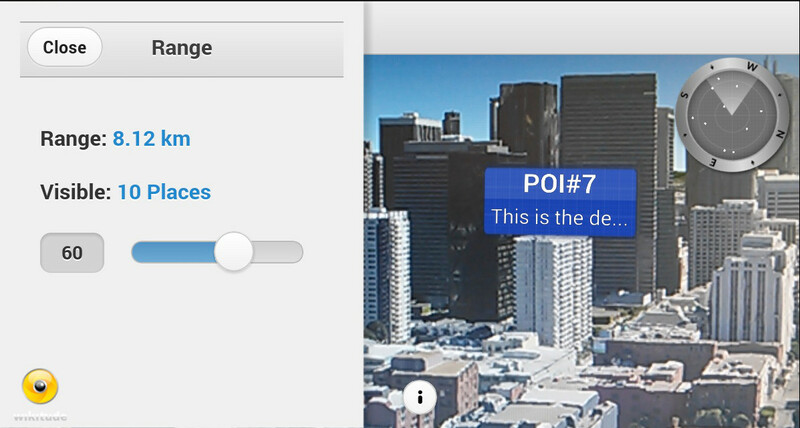 We recommend to use jQuery mobile for the implementation of the UI in the augmented reality view. It is well documented and can even be bundled into the app or hosted on your own web server. 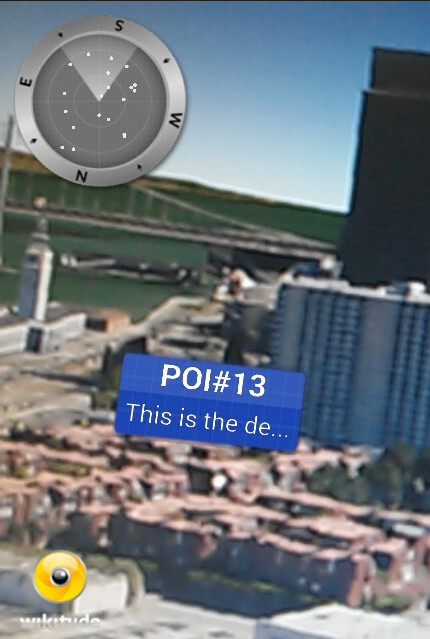 In this sample a POI detail panel appears when pressing a cam-marker (the blue box with title & description), compare index.html in the sample's directory. 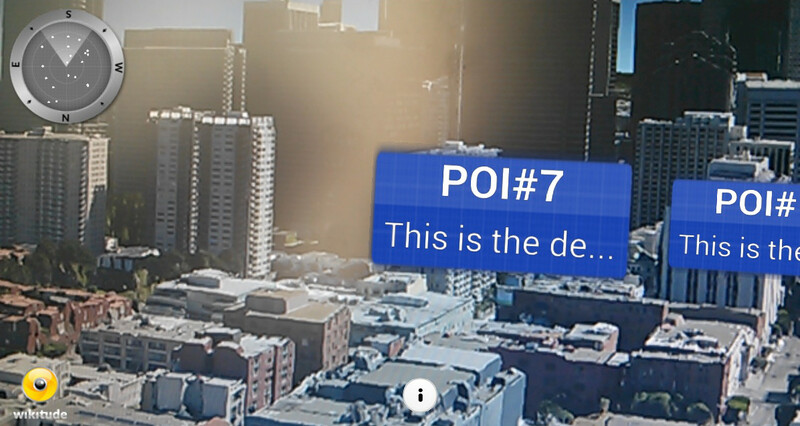 When selecting a marker the content shown in the POI detail div is updated. At the same time the panel is animated from right to left. It is recommended to give the user a hint where places are located in the user's vicinity. The easiest way to provide orientation assistance is an AR.Radar element. Every AR.GeoObject (e.g. a cam marker) can have a representation in the radar element, usually indicated by a small dot. We advise you to use an absolute position for the element which will be referred to the radar container. Keep in mind: In case the DOM element is updated on the fly via jQuery or responsive design use AR.radar.notifyUpdateRadarPosition(); to force radar position/size updates, otherwise the very first position/size will be used. // e.g. display distance, custom filtering etc. 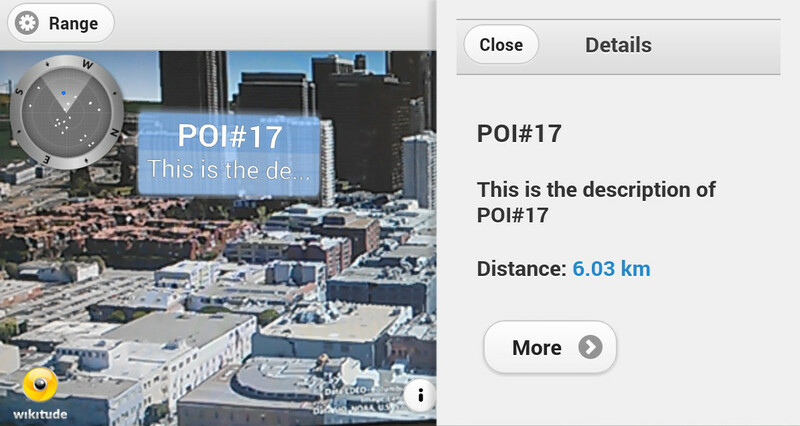 Users are sometimes only interested to see POIs within a certain range. This sample provides an additional button in the titlebar button to allow users to change the range of interest. Afterwards define the panel layout for distance range. In this case the current range in meters and the number of visible POIs is shown in the panel. // updates values show in "range panel"
The World.showRange function is executed when a user presses the Range button. 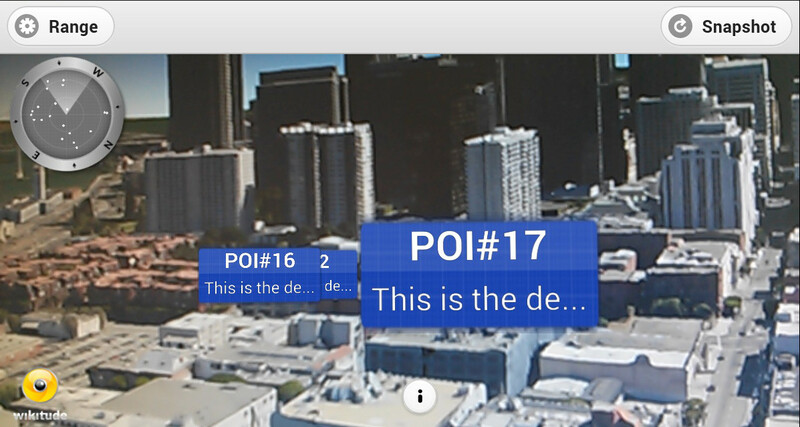 You may need to reload POI information because of user movements or manually for various reasons. In this example POIs are reloaded when user presses the refresh button. 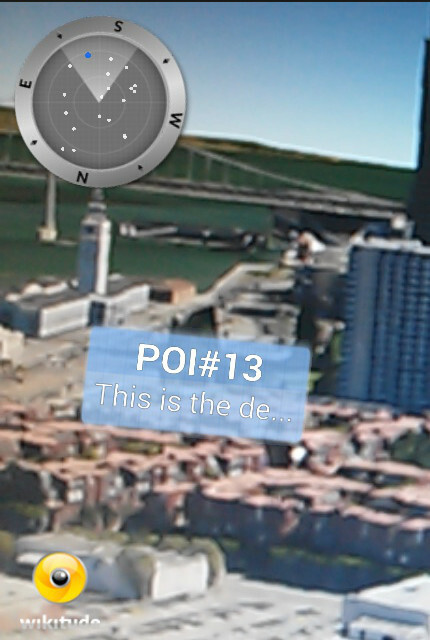 The button is defined in index.html and calls World.reloadPlaces() on click. The implementation of World.reloadPlaces() is part of the ARchitect World (reloadingPois.js) and executes World.requestDataFromServer which retrieves data according to the user's current location from a web service. Sidenote: In certain circumstances your web service may not be available or other connection issues can occur. To notify the user about connection problems a status message is updated, In your own implementation you may e.g. use an info popup or similar. A More button is added to index.html which calls the function World.onPoiDetailMoreButtonClicked. World.onPoiDetailMoreButtonClicked is implemented in nativedetailscreen.js and executes AR.platform.sendJSONObject(...).The native project intercepts this call, this is shown below. Please have a look at the this section which describes the custom url scheme native part. Handling of picture sharing is done in native code.